Yesterday I made the meals for my monthly meal swap. I have been wanting to make a family favorite, macaroni 'n' cheese pie, for several months, but needed to have enough pie tins and to bake a ham. We just had two ladies drop out of our group so I only had to make 6 pans, but I also wanted extra for my family and for families with new babies who we sometimes take meals to. I decided to make 10. 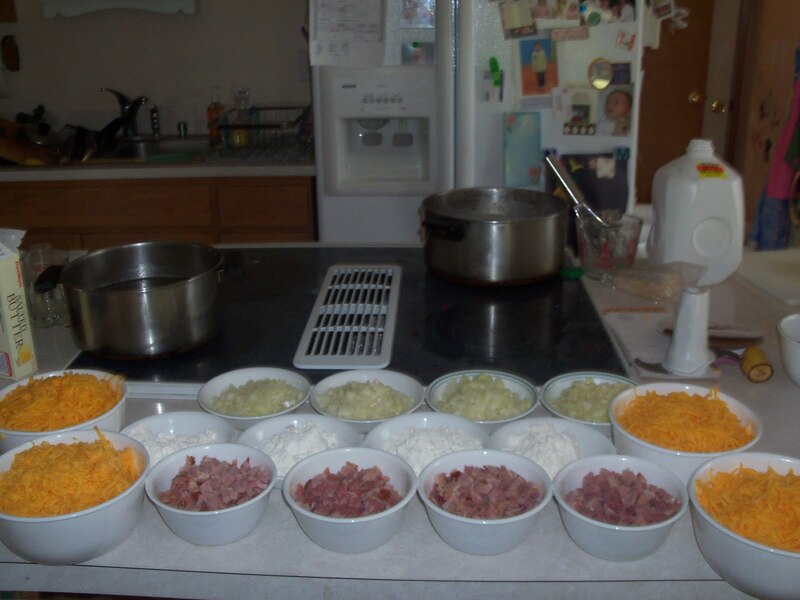 First I had to prepare & measure the ingredients. I planned to make 5 double batches but didn't think to take a picture until I was already into the first batch. 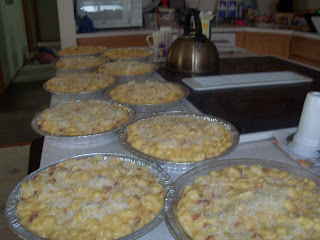 As it turned out I only made 4 double batches because the double batches were filling about 2 1/2 pie tins. I think my recipe is for a 9" pie plate and I had 8" tins. It took me a lot of time to put these together because I had my own kids plus a friend to play and, as you can imagine, I had a lot of interruptions. 1. Preheat oven to 375. Grease/spray 9" pie plate & sprinkle with breadcrumbs. 2. Cook noodles with 1 t. olive oil - should make about 5 cups cooked. 3. Meanwhile, melt butter at med/high heat. Add onion & sautee about 5 minutes so onions get really soft. Stir in flour, salt, mustard, white pepper, & nutmeg. It should bubble quickly. 4. Gradually add milk until sauce thickens. Add cheese reserving 1/2 cup for topping. 5. Remove from heat and stir in cooked noodles. Spoon mixture into pie plate and sprinkle with reserved 1/2 cup cheesse. 6. Bake until golden & bubbly, 25-30 minutes, and let stand 15 minutes to set. Slice it into pie wedges and serve. This recipe also suggests adding food coloring as the sauce thickens to make it more orange, but I prefer to leave it out. Also, when I add one cup of ham to this recipe I leave out the salt. Usually the ham is salty enough to flavor this dish. I used 2 c. of cheese in the sauce and sprinkled grated parmesan on top instead of the additional 1/2 c. of cheddar. Let me know if you try it out and enjoy it. Yum, I made mac n' cheese last night. Definitely a family favorite. Does this freeze pretty well? I haven't had the best of luck with freezing noodle dishes. Usually the noodle dishes freeze ok as long as the noodles aren't too mushy to start with. The only difficulties I've have with freezing meals is when there's something with milk that has to be reheated on the stove (must heat really slowly) or with potatoes. Potatoes tend to get mealy when they've been frozen.